In a year full of hate, there’s a lot of love in the world of comics. Romance is a shared theme among many of this year’s best comics: There’s heartwarming queer love in books like Aquicorn Cove, Heartstoppers, and On A Sunbeam; Tolkien-infused marital drama in the pages of Coda; a futuristic Romeo & Juliet reimagining in The New World; and even interspecies affection in My Boyfriend Is A Bear. Oni Press has an especially strong 2018 with three titles on our list, all created by women. In the world of superheroes, two Marvel titles go back to basics with exceptional results, and Jack Kirby’s New Gods get a modern update perfect for these anxious, unsettling times. Books like Sabrina directly tackled this tumultuous political moment, while The Seeds imagined where the world’s current destructive path would lead. 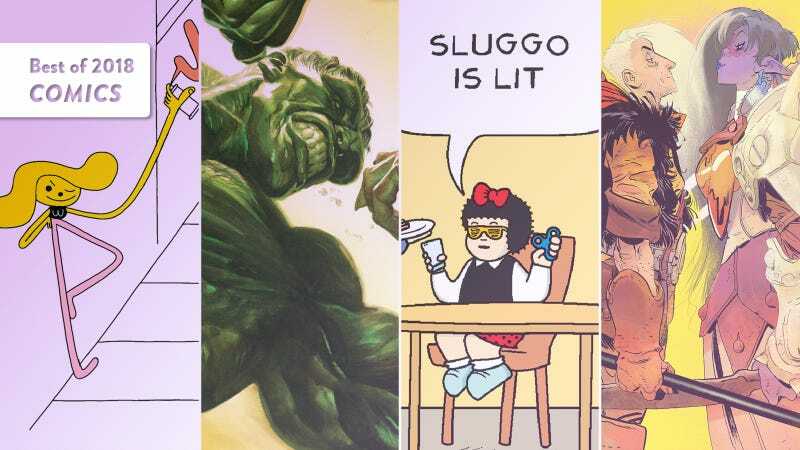 From masters of the form to rising stars making a name for themselves, this year’s best comics showcased remarkable talents dedicated to pushing the medium forward.